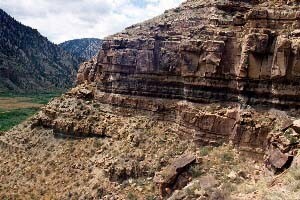 Middle Member of Green River Formation, Nine Mile Canyon. Or purchase from the Natural Resources Map & Bookstore. Photographs taken during Field Trip #4 at the AAPG National Convention, Salt Lake City, Utah, May 2003. Slide show presented at the AAPG Rocky Mountain Section Meeting, Laramie Wyoming, 2002. Poster presented to AAPG Rocky Mountain Section Meeting, Laramie Wyoming, 2002. Poster presented to AAPG National Convention in Denver, Colorado, June 2001. Selected references on the geology of the Uinta Basin. These lists are not intended to be a complete bibliography. Craig Morgan has not read every reference cited. Many of the references were taken from the reference lists of published articles and were included because the citing or title appeared to be applicable. These documents have not been reviewed or approved for publication by the Utah Geological Survey. Last update 3/18/02.